This is a collection of pointers to software I use regularly and that I find useful. I marked with a tag software that is only available on the specific platform I was previously using (Mac OS X), now abandoned for Linux. I use Emacs for code, notes, agenda, this site, and basically for all my text editing tasks. I started registering all my expenses in 2014. hledger is a version of ledger written in Haskell. Having access at the underlying library is useful, here an article I wrote about that: Finding duplicate accounts in hledger journals. I use github for work and for some public projects. Everyone of my projects is also in a remote repository on one of my servers. I use git-web to browse them. Before switching to Emacs I was a heavy Vim users. I still appreciate it and it's my choice when it comes to edit text on remote systems. My configuration: https://github.com/larsen/vim-configuration. 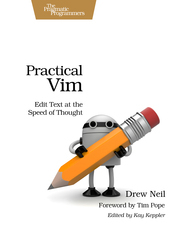 If you want to improve your Vim skill, Practical Vim is an excellent resource. I occasionally use R (in the integrated environment RStudio), mostly to produce graphics using ggplot2. I love spreadsheets, in general. Or "spreadsheet computing", as I'm compelled to say. I would like to use something not-proprietary but Excel is still the best in the category. Always on, on a remote system to which I connect to via ssh. Sometimes I think about using something like znc to integrate IRC in Emacs but I guess the benefits aren't worth the time. Hakyll is a static site generator written in Haskell. Used to power the blog section of my site. I now use different tools for writing, but Nisus Writer is worth mentioning because it's the product I used, back in 2008, for my largest writing project so far: Pocket Perl. I am one of those guys that practically live in a shell. After a long time spent in Terminal.app I found this. It has many additional features that make life simpler or even nicer (badges, shell integration, …). I occasionally give presentations. I was very fond of MagicPoint back when I was using Linux, but when I switched to Mac OS X I didn't think the X11 dependancy was convenient. Keynote takes a totally different approach but is good enough. I'd love to use a tiling window manager (i3 or xmonad, probably), but I'm on a Mac so the best I could find is this utility. Here some software I'm looking for. If you happen to have something to suggest please contact me! I'm currently using Time Machine for backups. It certainly works well, but as I'm considering the opportunity of switching back to Linux, I should devise a new way to do backups. Perhaps because usually the filename has little to do with its content? I think pdf-tools is the right tools. It is an extension of Emacs, therefore fits nicely in my workflow. Annotations are embedded in the document and visible via some other tools.